7th Annual Graduate Conference of the Cluster of Excellence "The Formation of Normative Orders"
There are, however, several reasons to doubt this air of novelty. Worldwide Internet penetration is over 40%, and mobile broadband penetration in the OECD is over 80%. Many scholars consider Internet access to have become a basic human right. Computer assisted fraud has been a criminal practice for four decades, and the incident best approximating international cyber warfare occurred almost ten years ago. So-called digital natives are aging rapidly, and their aesthetic imperative has become mainstream. Whatever their revolutionary potential in the longue durée, computers, their data and their networks have become a mundane, ubiquitous and assumed feature of everyday life. 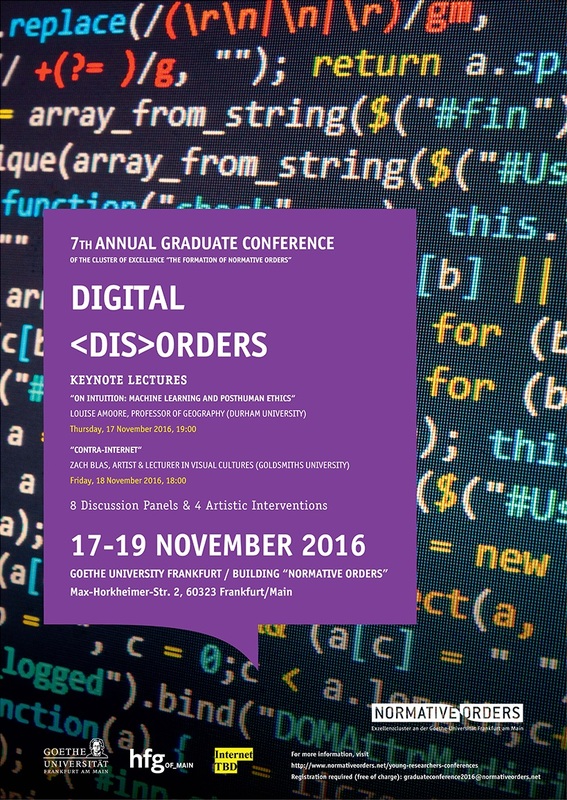 We welcome you to reflect with us on our arrival in digital normality so as to better understand the dynamics of digital order and disorder. We will touch upon such topics as the features and production of space in a digital society, the political economy of media and artistic production, the politics and modes of rule in the digital/posthuman age, the diffusion of responsibility in algorithmically controlled processes, and the social practices and subjectivities produced and assumed in a world of ubiquitous connections and computers. Beyond these more academic engagements with the subject matter, we are happy to host a number of artistic interventions that challenge intuitive understandings of the forms of digital society and present alternative, creative representations of digital realities. These range from interactive demonstrations of textual data-mining; a video installation challenging the pre-determination of emotions through facial recognition technology; live, choreographed web design; and more. We have included other unconventional events in the program, like the mini-saloons and party, to provide time and opportunity to converse about these topics, the questions they provoke and the ideas they inspire. Finally, it is our privilege to welcome two keynote speakers who have indelibly marked our thoughts on and appreciation of digital culture. On Thursday evening Louise Amoore, Professor of Geography at Durham University, will present her thoughts On Intuition: Machine Learning and Posthuman Ethics, exploring what the ‘agency’ and ‘intelligence’ of machines implies for ethics. And on Friday evening Zach Blas, renowned Artist and Lecturer in the Department of Visual Cultures at Goldsmiths University, will elaborate his thoughts on Contra-Internet, a project that explores subversions of and alternatives to the Internet. Philipp Sack (Braunschweig): Queries, or: What Comes after the Death of ”Commonsensical Empiricism”? Robert Ziegelmann (Heidelberg): Imagination and Distance: Does Digital Media Abolish Humanity?